As China has not committed to absolute emissions cuts, it has not identified the ghg atmospheric concentration stabilization level that its INDC would seek to achieve. In the National Climate Change Plan (2014-2020), China referred to the ‘international consensus’ on the goal of limiting the increase of global average temperatures to not more than 2 degrees Celsius above pre-industrial levels (National Development and Reform Commission, 2014, p2). However, the government has not made an explicit commitment to the target but demands that developed countries cut their emissions for historical reasons. China’s INDC does not explain why or how it is fair and ambitious, an explanation which would be necessary to inspire the development of ambitious climate policies in other states since China’s ‘irresponsibility’ is often used as an excuse for developed countries’ own inaction. The Chinese government has pledged that China’s INDCs is not only motivated by national economic interests but also by the government’s ‘sense of responsibility to fully engage in global governance, to forge a community of shared destiny for humankind and to promote common development for all human beings’ (National Development and Reform Commission, 2015, p2). Either way, China will achieve co-benefits from the INDC as it helps it to reduce the country’s reliance on coal for power generation, decrease air pollution and hence to prevent 100, 000 premature deaths annually, and create an ‘additional 500, 000 full-time equivalent (FTE) green jobs in the domestic renewable energy sector’ (Höhne et al. 2015, p21). A day after the publication of China’s INDC, China’s National Center for Climate Change Strategy and International Cooperation published a commentary demonstrating that China has considered the ethical dimensions of its INDC. The commentary describes the ambitions and economic, technological and social challenges of China’s climate policies. It also highlights China’s developing country status. It suggests that if the state manages to curb emissions at a faster rate after 2030, China’s long-term development path will be consistent with the objective of limiting the global average temperature increase to below 2 Celsius degrees. (Fu, Ji and Liu 2015, p7-8.) In contrast, the Climate Action Tracker, an independent scientific analysis team representing four research organizations, argues that China’s INDC will not limit global warming to below 2 Celsius degrees, unless other states commit to more ambitious emissions reductions than China (Climate Action Tracker, 2015). The Chinese media have reminded the world that China should not be expected to shoulder broader global responsibilities before it has met domestic challenges and achieved a higher level of economic development. The Climate Action Tracker (2015) gives China’s INDC a rating of ‘medium with inadequate carbon intensity targets’. Given China’s developing country status, however, its low-carbon development plans are quite ambitious. It has incorporated climate policy into all its development plans and aims to build a low-carbon society. Notably, the State Council has elevated ‘ecological civilization’ to a prominent strategic guideline to be integrated into China’s economic, political, cultural, and societal plans. It declares that ‘green development’ is important to the development of China’s competitive advantage and hence it plays an important role in building national comprehensive power (Xinhua, 2015). The Chinese government, however, is aware of these difficulties. In spring 2015, the State Council published a 12, 000-character document entitled ‘Opinion on acceleration for the promotion of ecological civilization’ which not only sets objectives and instructions on how to reorganize the Chinese economy to make it greener but also addresses how to overcome obstacles to improving the environmental standards of its society (Xinhua, 2015). Although environmental NGOs are currently quite well tolerated in China, the participation of citizens, NGOs, and other interested organizations in (foreign) policy decision-making continues to be limited. In actuality, no formal mechanisms are available for public participation in questioning China’s ethical position on climate change. China’s environmental NGOs play an important role in raising public awareness on climate change and environmental problems within China. Previously, only government think-tanks and research institutions were invited to participate in (environmental) policy making processes but now it seems the government is opening some of its processes to NGO participation as well. For example, China Civil Climate Action Network (CCAN), the umbrella organization of climate NGOs, took an active part in the formulation of China’s National Climate Law by organizing workshops, meeting with government officials and submitting a recommendations paper to the National Development and Reform Commission that is in charge of preparing climate change law (CCAN, 2011). Because dealing with environmental degradation is one of the biggest challenges that contemporary China faces today, the Chinese government has little choice but to take climate change seriously. As China’s national identity is in flux, however, it is very difficult to agree domestically on the scope of China’s global responsibility. On one hand, many Chinese think that the state should take more international responsibilities; on the other hand, China’s identity as the leader of the developing world has ‘sometimes forced it to be more uncooperative in international environmental affairs than it would actually like to be’ (Kobayashi, 2005, p88). Only recently has China started to refer to itself as a major power in international climate negotiations. At the same time, China continues to emphasize the development first principle and underline the historic responsibility of developed countries. In September 2014, Special Envoy Zhang Gaoli declared at the UN Climate Summit: ‘responding to climate change is what China needs to do to achieve sustainable development at home as well as to fulfil its due international obligation as a responsible major country’ (Zhang, 2014). The Chinese government has encouraged central and local governments, public institutions, businesses, and individuals to practice ‘low-carbon lifestyle’ living by issuing a wide variety of policies and action plans. Many of these policies were introduced in China’s INDC. These policies, however, do not include any encouragement to consider ethical issues because China argues that international expectations of its global responsibility should be closely linked to its stage of development. Some Chinese cities are indeed taking climate change very seriously. At the U.S.-China Climate Leaders Summit held in Los Angeles, California on September 15-16, 2015, eleven Chinese cities and provinces committed themselves to peaking their ghg emissions before the national target of 2030 and decided to establish the Alliance of Peaking Pioneer Cities. In particular, two of the biggest cities, Beijing and Guangzhou, have pledged to peak CO2 emissions by the end of or around 2020. (U.S.-China Climate Leaders’ Declaration, 2015). As a fact sheet of the White House notes, the “commitment of so many of its largest cities to early peaking highlights China’s resolve to take comprehensive action across all levels of government to achieve its national target, put forth in last year’s Joint Announcement on Climate Change, to make best efforts to peak its emissions earlier than 2030.” (White House, 2015a). I would make three recommendations. First, international climate negotiations should not focus only on nation-states’ responsibilities but pay more attention to affluent citizens’ cosmopolitan responsibility. Not all citizens of developing countries are poor (and not all people living in developed countries are affluent) but there are millions of affluent people living in those countries. An affluent person in China generally consumes more than the average European – or even more than affluent Europeans because not only the rich, but also the rising middle-class Chinese, frequently display their wealth through the consumption of luxury goods. In particular, car ownership, especially of sports utility vehicles, is now a symbol of personal freedom, financial success and prestige among the affluent Chinese. Given that per capita emissions of the richest 10% of Chinese are well above those of the poorest 10% of Americans (Harris, 2011, p231), is it fair that they can avoid climate responsibility just because they happen to be born in and live in a developing country? 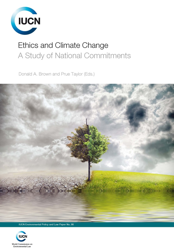 Cosmopolitan ethics should obligate each person who emits greenhouse gases to act and to aid, if she or he is affluent, regardless of his or her nationality. In the words of Paul G. Harris, ‘all things being equal, a poor person (measured by some reasonable standard of purchasing power parity) in Germany may be less obligated to act on climate change than is an affluent person in, say, China or Chile, if the former pollutes less.’ (Harris, 2010, p142). Second, responsibility should not be exclusively distributed on the basis of the contribution of the ‘supply-side’ to climate change but ‘demand-side’ should also be taken into account when defining states’ climate responsibilities. At the moment, international climate politics tend to focus on states’ territorial emissions. This means that the UNFCCC penalizes countries that produce goods rather than the countries (or more accurately, individuals) that consume them. The lion’s share of China’s increasing ghg emissions are caused by western consumer demand. If these ‘offshore emissions’ were officially acknowledged, it would make international negotiations fairer, generate trust, and could increase China’s willingness to take a more active role in global efforts to mitigate climate change. That is why I would suggest that future climate negotiations should pay more attention to consumption by affluent individuals rather than states’ total emissions caused by production. Third, China’s permanent seat on the UN Security Council brings special responsibilities for the Chinese government. From this vantage point, it can be argued that China has a moral duty to carry more responsibility than minor states and it cannot escape its obligation to pursue serious climate change mitigation policies. In the end, apart from the U.S., China is the only country whose national policy can make a global difference. Although China is not a developed country, it has pledged to provide developing countries with climate finance. It will not contribute to the Green Climate Fund (GCF) but instead has decided to establish its own South-South Cooperation Fund (Liu, 2014). In September 2015, China announced that it will “make available ¥20 billion [about 3 billion USD] for setting up the China South-South Climate Cooperation Fund to support other developing countries to combat climate change, including to enhance their capacity to access GCF funds” (White House, 2015b). The author would like to thank the Finnish Cultural Foundation for financial support for the research on which this national report is based. This entry was posted in China and tagged China's INDC. Bookmark the permalink.